What are the #occupy camps? The Occupation camps across the world are not just protest sites. They are not just new political spaces. They are in fact embryos of the emergent new world. If you go to the nearest camp you'll find in there everything you'd need to survive, even during a Canadian winter. 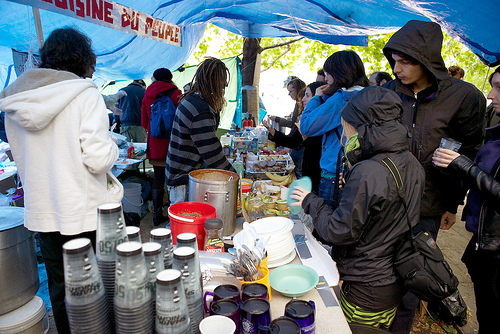 For example, only two days after it's initiation the Montreal camp had already a health center, a kitchen that fed easily over 500 people the very first evening, a center of communication and coordination, an information and donation center, a political space (where the assemblies take place), a cultural space (where people play drums, dance, paint...), and obviously a housing space. Believe it or not, we even have the protection of the militia (the Quebecois patriots), who put their tent across the street from the main camp, having great visibility over the area.